What ? The data monitoring package “DMP” is a new feature available for AirScape whole house fans. 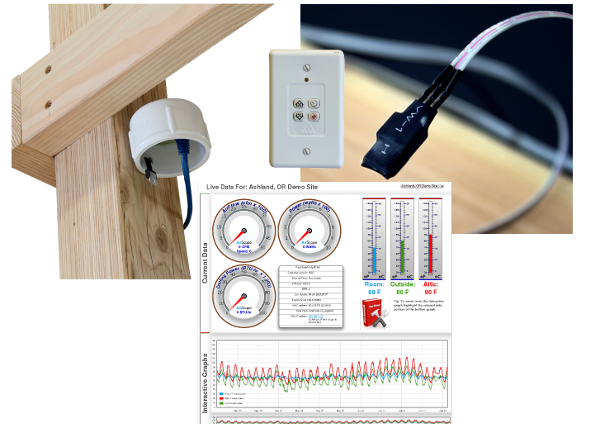 This package of extra sensors and software allows whole house fan owners to view room, outside, and attic temperatures. Users can view the temperatures through their browser enabled devices (smart phones, computers, tablets …). Historical data will be saved on AirScape servers and will only be available by secure login. Why is this cool ? 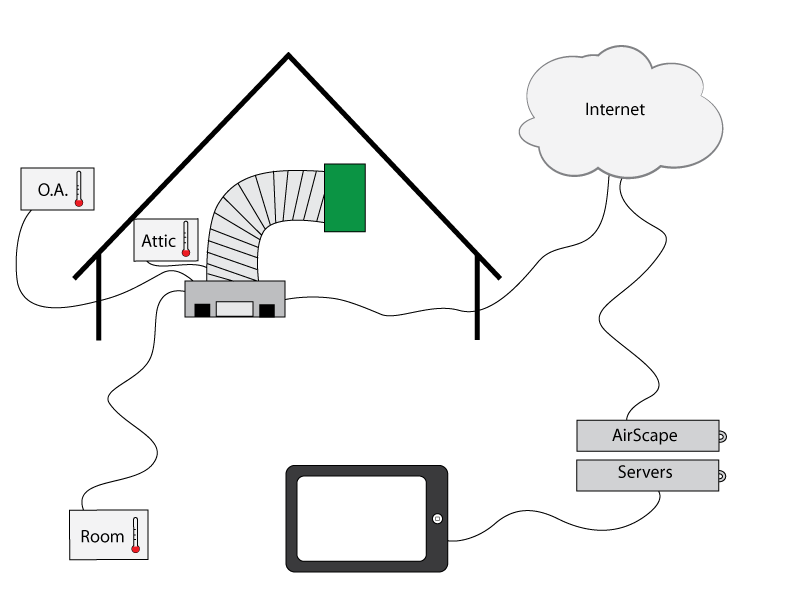 You will be able to check temperatures in your house, attic, and outside remotely. By looking at the graphs of temperatures, you’ll be able to decide on the best ways to save utility costs. Upcoming software will be able to total your annual energy savings. When? Available in the next 2 weeks on select models. Privacy ? Your data will only be available to you, secured by encrypted passwords. Aggregated data that does not reveal the user’s identity may be used for research purposes. All AirScape models, except the Kohilo 2.8, use low voltage controls (24 volt) to turn the unit on/off and switch between high and low speed. Never wire line voltage to your wall switch. Run 18-22 gauge wire (x3) from the WHF to the wall switch location. Attach the 3 wires to the control board at the screw terminals COM RED, START BLK, and HI SPD BLU/WHT. Connect the 3 wires to the wall switch (see below). We have pre-wired wire leads to the wall switch to indicate the wire locations. The wire leads correspond to the control board as follows: RED to COM RED, BLACK to START BLK, and WHITE to HI SPD BLU/WHT. 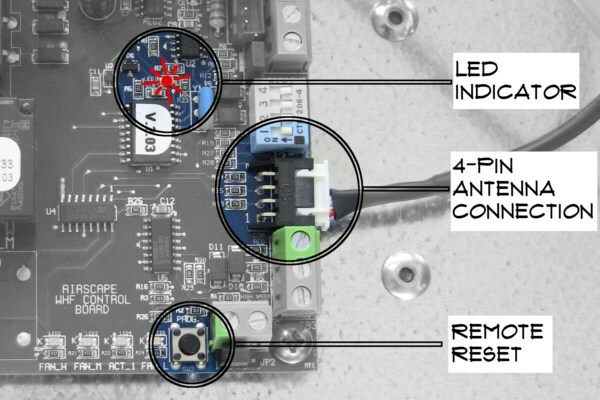 This is a brief reminder of the proper location for wiring the wall switch to your AirScape control board. 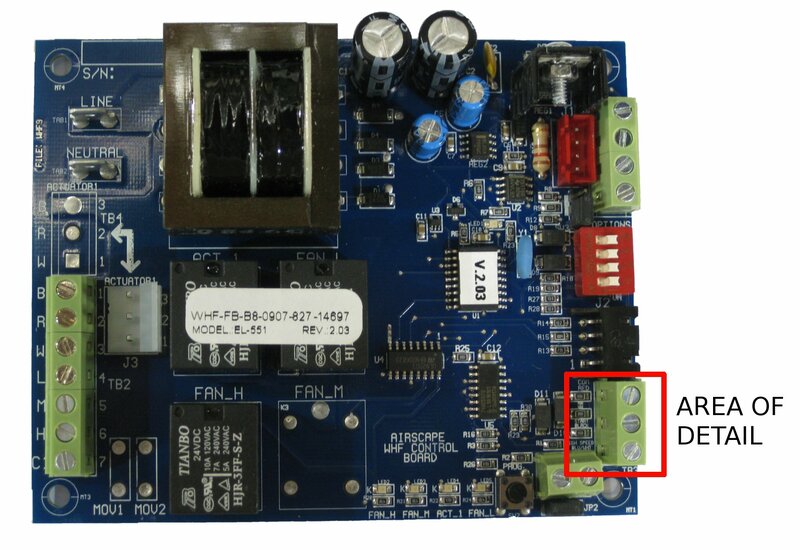 We have noticed that sometimes people, even licensed electricians, wire the wall switch to the auxiliary actuator terminal (red crossed out circle). Wiring at this incorrect location will blow the 3 amp circuit breaker on your unit and possibly damage your control board. Regardless of your experience level we recommend looking at the wiring diagram in the instruction manual before wiring the wall switch. The correct wiring location is indicated by the green circle with check mark. 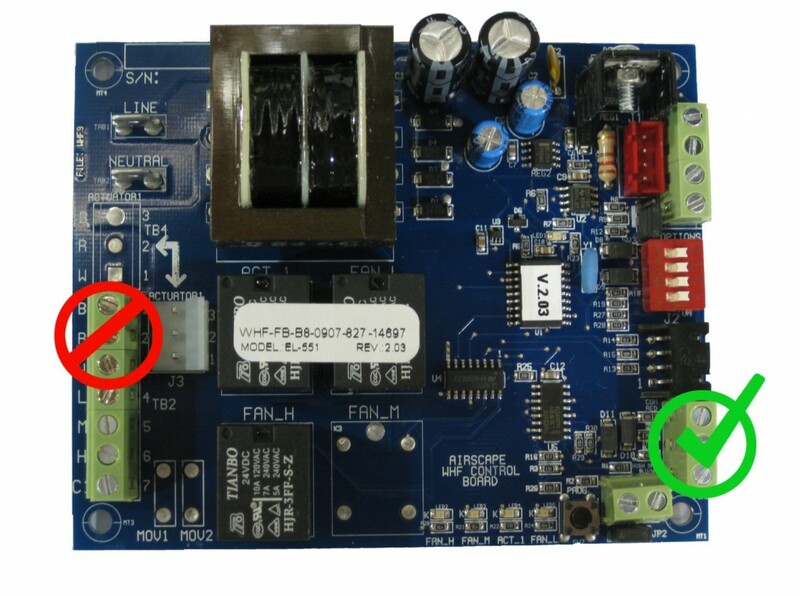 The newest version of our control board has a master override or interlock. 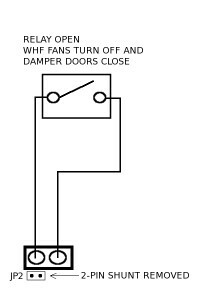 The interlock, which is now required by some building codes, effectively disables the WHF by closing the damper doors and turning off the fans. It is often used in conjunction with smoke detectors or mechanical systems located in the attic. The idea is that if the furnace turns on or the smoke detector goes off the WHF will shut down. This could slow down the spread of a fire or save $$$ if the furnace was accidentally turned on. 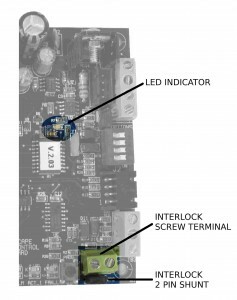 The interlock is integrated into our 24v digital controls on V4 of our control board. To use the interlock simply remove the two-pin shunt and run low voltage wire from the interlock screw terminals to the relay on the device that will disable the WHF. 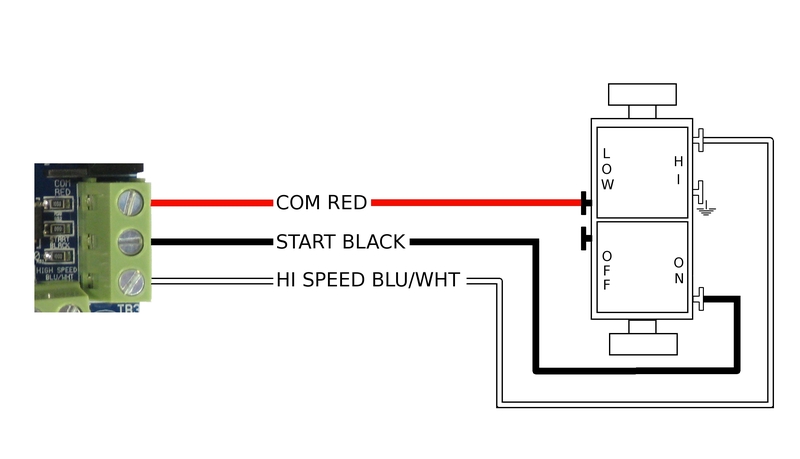 To activate the interlock the relay should interrupt the 24v current. Do not wire 120v to the interlock. When activated a solid red LED will illuminate on the WHF control board. The fans will turn off and the damper doors will close. Once the interlock is disengaged, the LED will go out. The WHF can be restarted by flipping the wall switch off and on again or by using your remote.